To date, I have no idea how or why the Full Metal Panic franchise is familiar to me but not familiar to me. Perhaps I have literally come to the point where I've watched so much anime during my lifetime that I'm creating memories for anime that seem similar to other anime I've seen. I've been racking my brain trying to think of where I've seen this anime before, but I get zilch each time. Oh, well. Full Metal Panic? 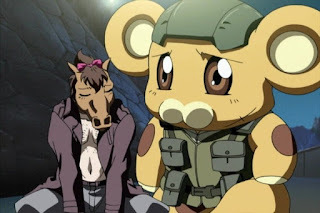 - Fumoffu is the second entry in the Full Metal Panic franchise, but that doesn't mean it's second in stature. The humor that threw the pacing of the first series off a bit finds a welcome home in this series. Essentially, the humor IS this series and that's a good thing. Fumoffu's humor is actually pretty good and the creators involved had enough sense to not try and further the previous storyline at the same time. There's no real overarching plot. It's just twelve episodes of silliness. The series makes fun of itself and just about every other anime trope around at the time. There's even the obligatory hot springs episode, but that gets turned on its head. This is a comedy that knows it is a comedy and that's an approach I always enjoy. And unlike a lot of other anime comedies, I feel like this one doesn't try to be too outrageous. Newer anime seem to lose me a bit on the humor front by being a bit too wacky. Sometimes not every character can be funny and the best humor acknowledges that makes the situations around that character funny. Sagara Sousuke doesn't even smile during this entire series, but his uptight persona is perfect for comedy. In the first series his inability to fit in made him look incompetent in a bad way since the series was trying to be taken somewhat seriously. It wasn't really all that funny because it just made him look stupid. This time his dense attitude is actually hilarious since there is no seriousness involved. It's tough to take an idiot seriously when he is supposed to be a badass hero, but in comedy an idiot can be an idiot that thinks he's a badass hero and get it away with it because it's a comedy. Adam Sandler has made millions of dollars off that philosophy. The CGI that felt underwhelming is gone. So are the more questionable mecha fights. Instead we get the Mobile Suit Bonta-kun, the cutest Mobile Suit ever made. For the fun-filled penultimate episode we also get the Mobile Suit Bonta-kun Army. The animation also felt like an improvement. I'm not sure I'd call this anime at its best, but it's anime at it's funnest. 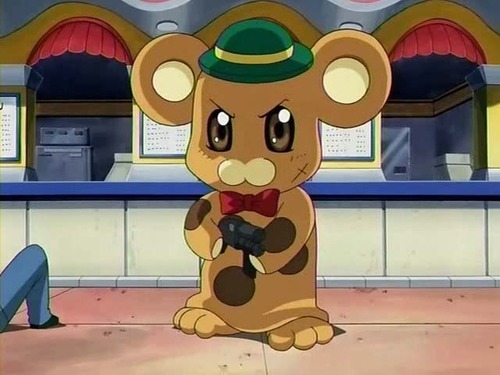 The characters are largely the same as they were in the first series so I imagine those familiar with Full Metal Panic will be the ones that find Fumoffu the most rewarding. However, this anime can be approached without any knowledge of the franchise. So, while not a coherent story that will expand upon its mecha origins, Fumoffu seems like a more worthwhile endeavor. Mostly because of the Bonta-kun robot that can only say, "Fumoffu."